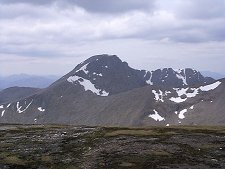 Possibly best identified to casual visitors as the next-door-but-one neighbours to Ben Nevis, Aonach Mor and Aonach Beag form the two summits of an extensive north-south ridge. In many ways that's a description that does the pair little justice. 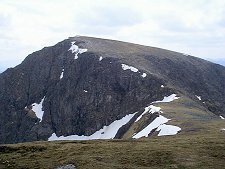 The top of Aonach Beag (the more southerly) does resemble a mossy, rocky billiard table; and you might be forgiven for mistaking the plateau of Aonach Beag for the sort of grassy featureless top more commonly found well outwith the highlands. But a glance at a map shows how far these impressions are from the truth. On both the east and the west of the ridge, geology has carved away huge slices of the mountain, leaving huge cliffs and, especially on the eastern side, a series of dramatic and lonely corries. 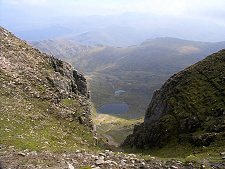 A fine example of this is the Coire an Lochan, seen through a dramatic gap in the edge of the plateau in the photograph below left. But the main thing that sets this landscape apart from your average grassy knoll are the stunning views. Wherever you are on Aonach Mor or Aonach Beag your eyes are drawn irresistibly to the west. Here the views first takes in the reddish ridge surmounted by Carn Mor Dearg. From here your view sweeps round to the left to take in the curved knife-edge ridge of the Carn Mor Dearg Arete. 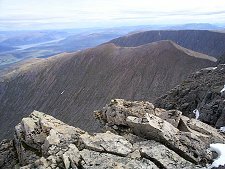 Then onto the best part of the view, especially from Aonach Beag rather than Aonach Mor, the dramatic north face of Ben Nevis with its 2,000ft cliffs towering over Coire Leis. With this featuring so large and so close to hand, the only slightly more distant views south to the Mamores or east to the Grey Corries that would be the highlight of any other trip pale into relative insignificance. The usually recommended route to the top starts in the popular car park at the end of the road in Glen Nevis. From there you follow the north side of the river through the Nevis Gorge and beyond, to the ruined cottage at Steall. From there a number of options are available tackling either Aonach Beag or Aonach Mor first en route to the other. 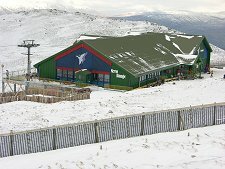 Other approaches are possible from the north, where the point of access is via the large car park at the foot of the Nevis Range Mountain Gondola. Once again a number of options are available. 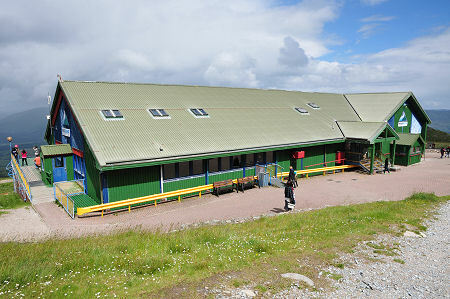 The serious disadvantage of approach routes from the north is the even more serious temptation placed in your way in the form of the gondola, which sweeps visitors effortlessly from the car park up to the Snowgoose Restaurant at a height of 655m, or just over half way up the mountain. 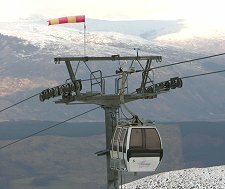 The gondola is here to support the extensive ski developments that have occurred across much of the northern face of Aonach Mor, with ski tows extending up to almost the 1,200m contour: and the usual lines of snow fences extending across the landscape. In summer the skiers are replaced by mountain bikers and more casual visitors. 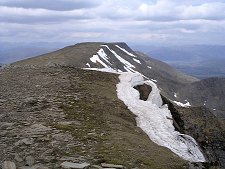 Whether you have reached the Snowgoose ethically or otherwise, the onward route tends towards then closely follows the edge of the drop on the Carn Mor Dearg side of the mountain before reaching the plateau of Aonach Mor, and your first sight of Aonach Beag beyond. 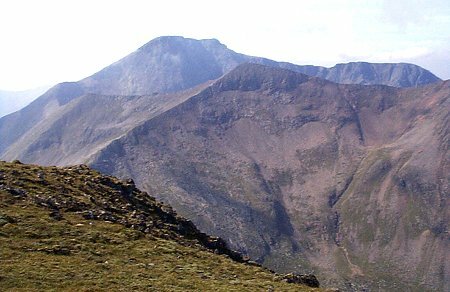 Aonach Mor is 1,221m or 4,006ft high; Aonach Beag is 1,234m or 4,048ft high. The climb from the car park taking in both summits involves around 1,350m or 4,400ft of height gain over a distance of about 10 miles. The unethical route involving the gondola saves around 600m of climbing and a couple of miles: but bear in mind the operating times of The Gondola.